Does your hotel already have a mobile app? That’s great news, because Zaplox SDK can help make your app even better. 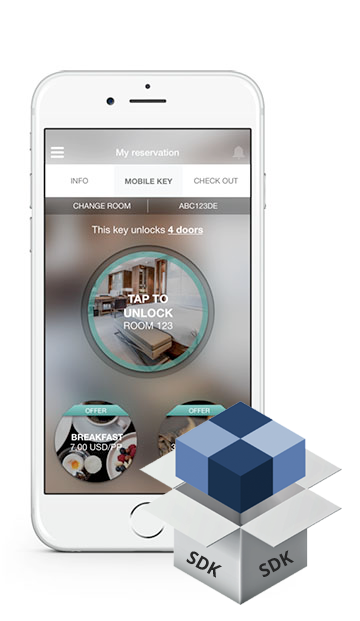 Zaplox is based on an open architecture and our SDK enables hotels and ISVs to add mobile check-in and mobile key to their existing mobile apps for guest engagement. Zaplox SDK provides everything you need to deliver the ultimate mobile guest journey, including mobile check-in and checkout —with seamless integration with the hotel’s PMS and lock systems. By leveraging Zaplox embedded functionality for mobile check-in and keyless, hotels can significantly cut down the cost and time for implementation of these high in-demand services. As a result, your guests will enjoy the new enhanced functionality in the app they are already accustomed to use – Your App. In short, the SDK adds functionality that enables your guests to use the mobile app to book a room, check-in/checkout, and unlock the door by holding the phone against the door’s electronic lock. In addition, the Zaplox SDK provides the ability to communicate directly with the guests via push notifications in the app, both prior and after the stay. For instance, you can create a promotion to increase reservations in the hotel restaurant or spa. Zaplox apps are fully customized for both iOS and Android.